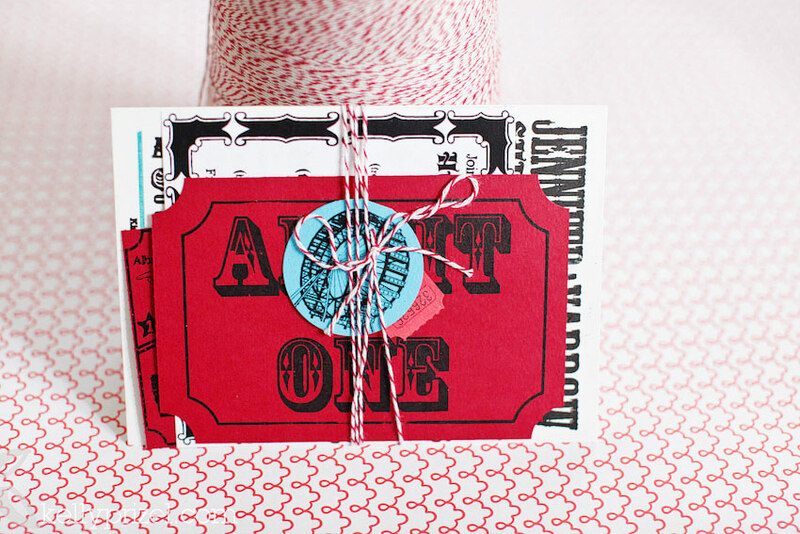 Make your invites unique with personalization. Add in some DIY ideas and your guests won't want to miss it. Include special activities on the invite. And it's not a bad idea to include details about what food will be served or suggested clothing if things might get messy. These clever ideas will help get you started. 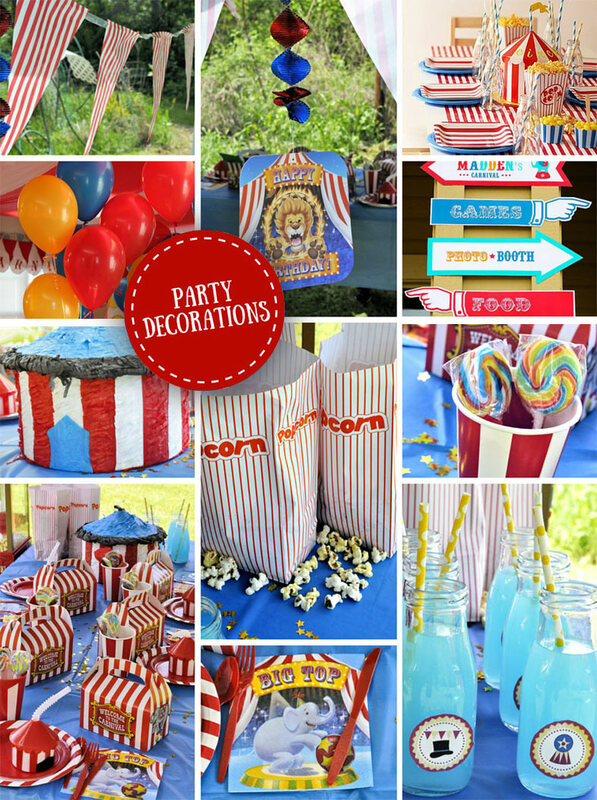 Be creative with the wording of the party details. Traditional red and white stripes with a contrasting blue are always a good choice and creative centerpieces for the tables can make party decorations really stand out. 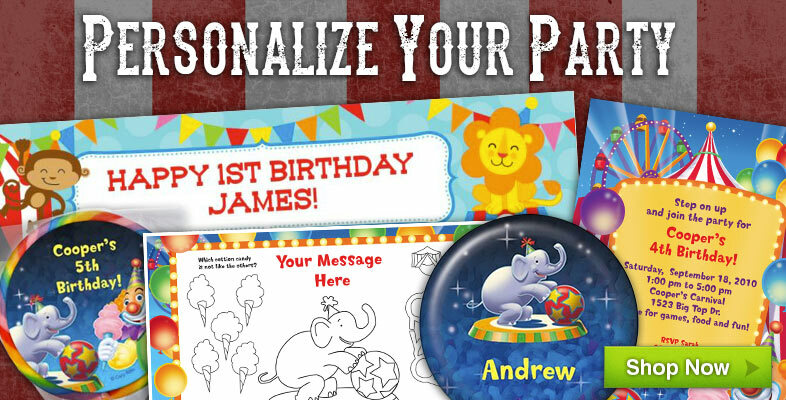 Top the party off with a personalized Happy Birthday Banner! You can get the banner, party favors and even custom labels for your water bottles. 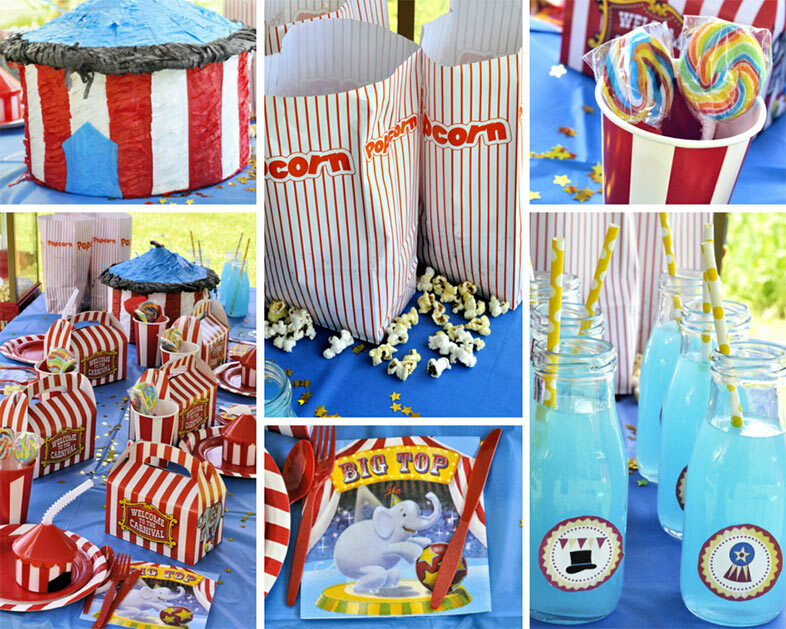 Customizing your party is very easy and makes a lasting impression. 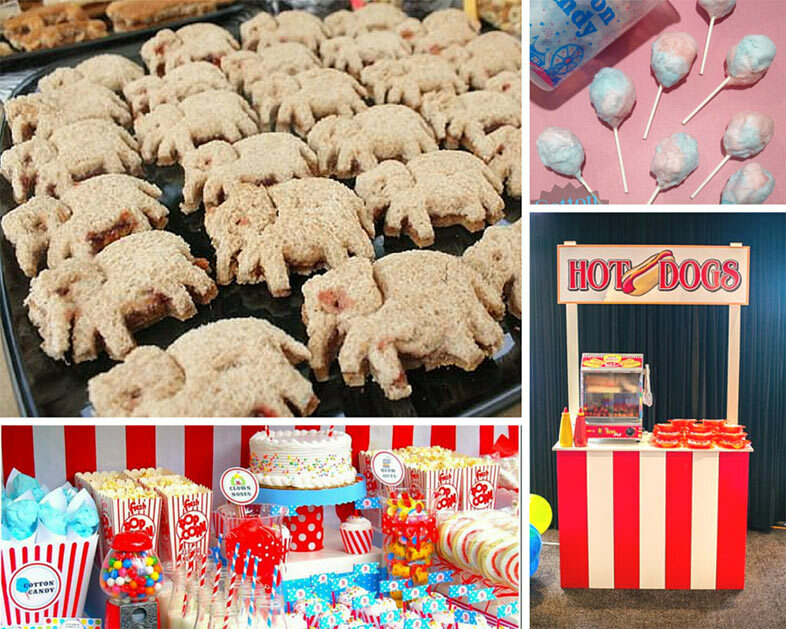 For a meal, try hot dogs, cotton candy and corn dogs for a real carnival feel. For the ultimate carnival treat make fried Oreos. Dip the cookies in funnel cake batter, deep fry and dust with confectioner's sugar. 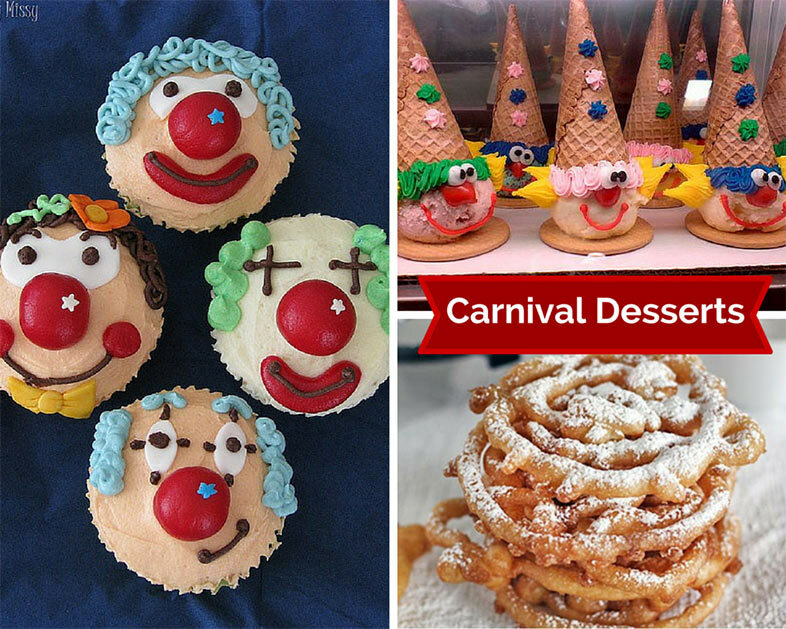 Clown Cupcakes: Bake cupcakes and top with white frosting. Make each one look like a clown's face using a red gum drop for a nose, M&Ms for the eyes, a bit of red licorice for a mouth, and cotton candy for the hair. Circus Cake: Bake a cake and cover it with white frosting. Use tubes of colored icing to add balloons in red, yellow and blue. Place toy animals around the edges. Clown Ice Cream: Make clown heads using scoops of bright orange or raspberry sherbet topped with sugar cone "hats" surrounded by rings of icing "ruffles." Make faces using round, red candy for the noses (try gumballs), M&Ms for the eyes, and red licorice strings for the mouths. Make these ahead of time, and freeze them until you're ready to serve them to your guests. 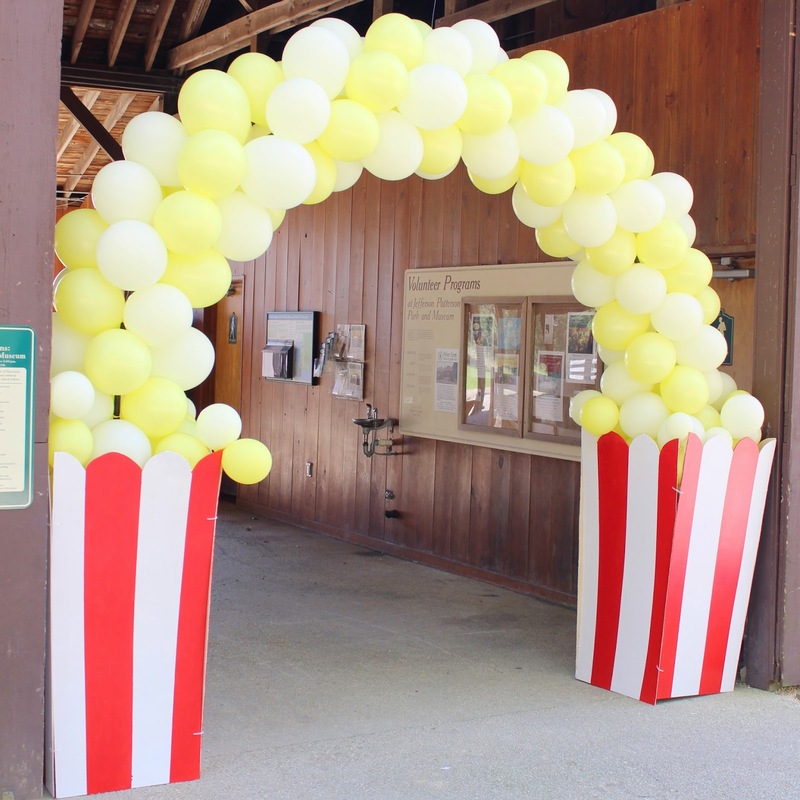 Use the links below to quickly find related theme party supplies, planning tips, printable checklists, and advice from our party planning experts. 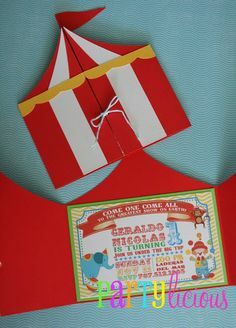 Carnival Party Supplies: Includes paperware, invitations, personalized items, favors, and decorations for your party theme. 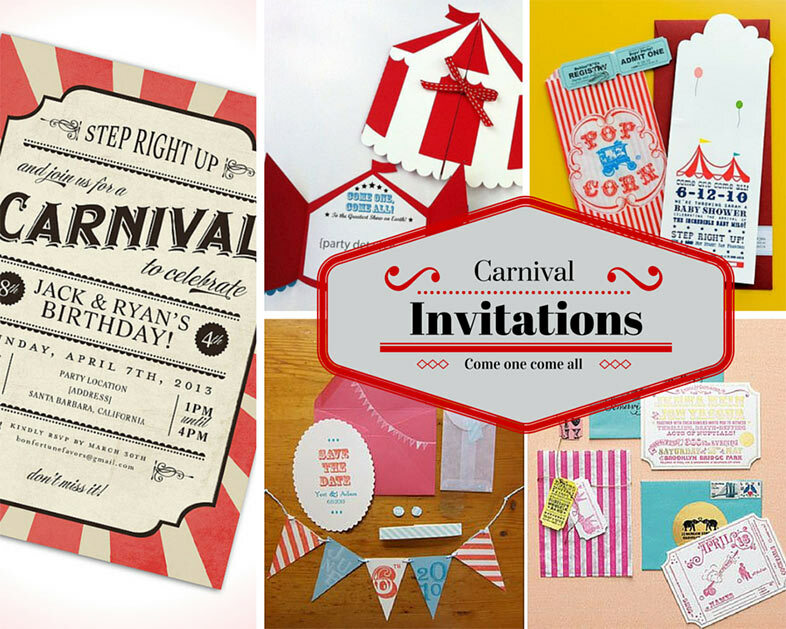 Carnival Personalized Items: Check out our exclusive personalized items including invitations, bookmarks, stickers, and more! Party Planning 101: Our useful party planning guide includes cake ideas, party etiquette tips, a printable guest list, and much more. 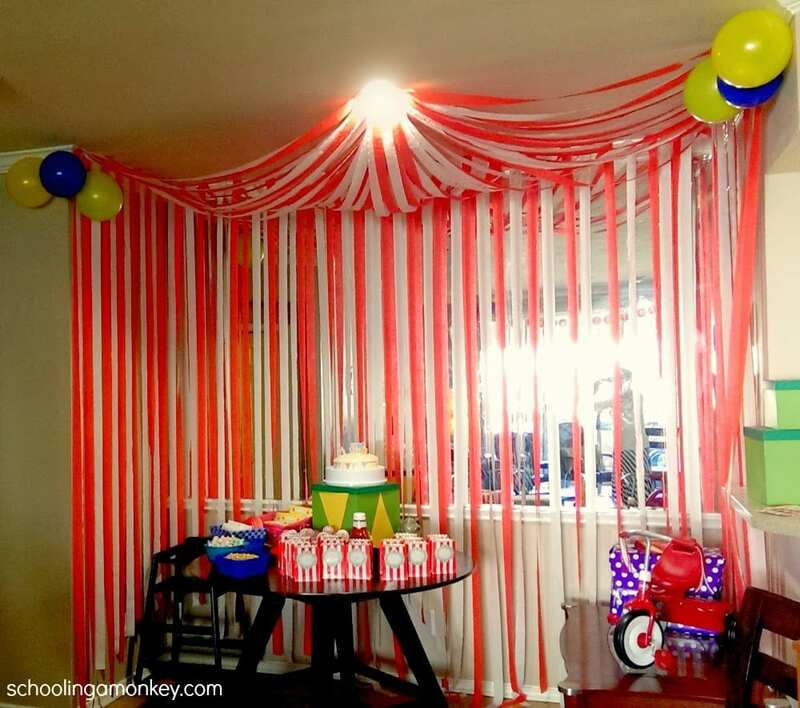 Birthday Party Decorating Ideas: This guide will tell you how to decorate for your party theme, what to do with balloons and streamers, how to decorate with food, how to set the table, and how to make your own party decorations. 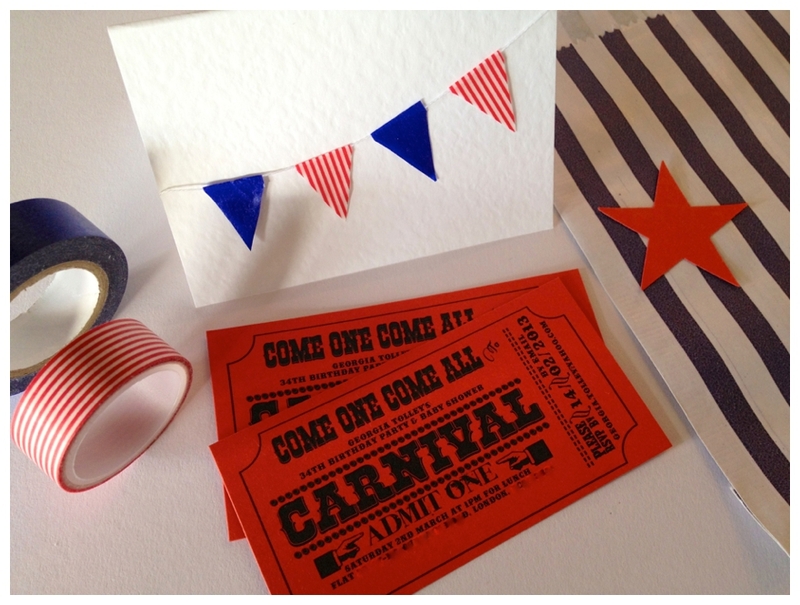 Parties Under $100: Use this guide to celebrate in style without breaking the bank! Party Budget Estimator: Download this guide to help budget your expenses. 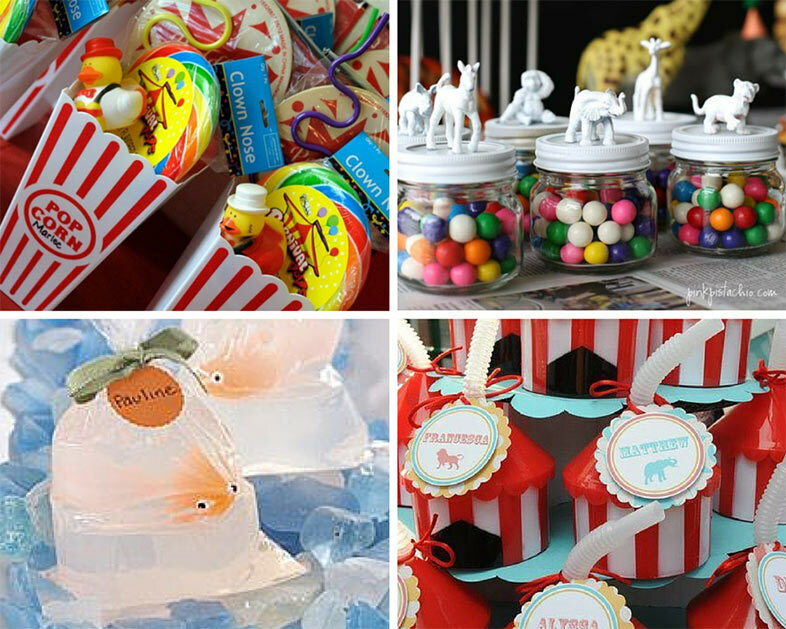 More Birthday Theme Ideas: Browse our list of over 130 themed party guides to find tips for your child's next birthday! 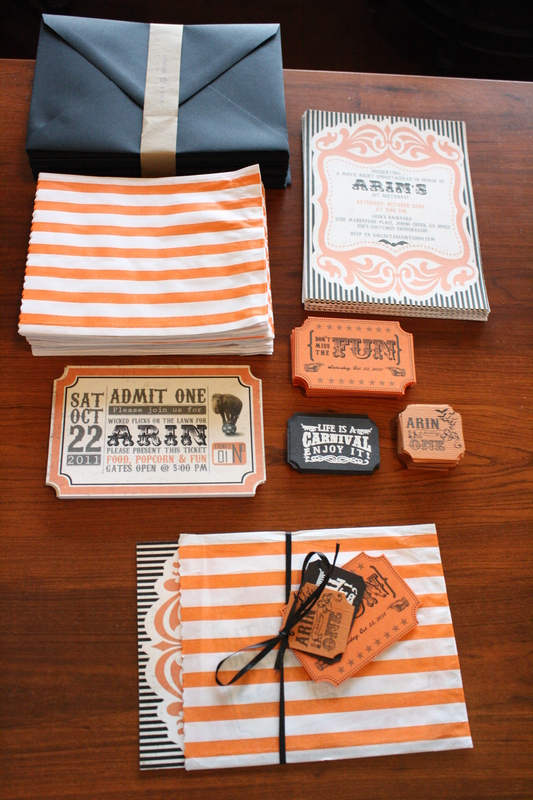 Each guide includes ideas for invitations, decorations, food, favors, games and more.